India is set to play 5 test matches in England since 1959. Today, the England and Wales Cricket Board(ECB) announced that England have agreed to set India to play 5 test matches in England by 2014. Since 1959, it’s the first time for India to play 5 test matches against England. 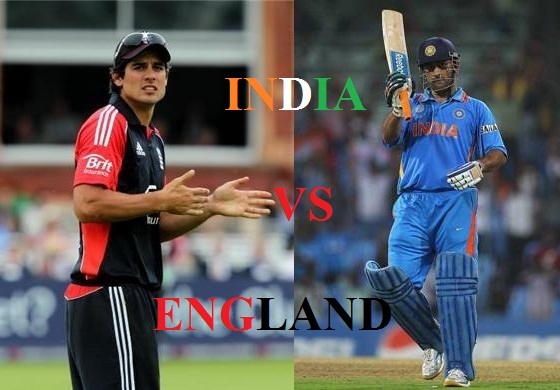 “England tour of India” also includes five ODI’s and one Twenty20 International matches. Its going to be huge entertainment for the fans of Cricket around the world. These matches help both the team to maintain their rankings and to stay at the top. The five test matches are planned to take place in Trent Bridge, Lord's, The Ageas Bowl, Emirates Old Trafford and The Kia Oval. The matches schedule has been released. As per the schedule, India tour begins with a three day match against Leicestershire on June 26 of 2014. The tour matches is set to host by Leicestershire, Derbyshire and Middlesex against India. ECB Chief Executive David Collier thanked Board of Control for Cricket in India(BCCI) and the venues for this tour and matches to happen. They are also expecting a great demand for tickets of all matches throughout the series. Considering the previous records of the test matches held between India and England, England seems to be top at the records. But this session will be more entertaining because both the teams are strong and are at the top 3 rankings of ICC test match rankings. England recently pushed India to third in the rankings by winning the Ashes cup against Australia. Before the Ashes series, India was at second place and now England attained the 2nd place and India at 3rd place. Find the schedule of “England tour of England” at the bottom. India vs. Pakistan is always most expected match of all time. But, India vs. England too a great entertaining and spicy game. When we look back in Cricket history, more interesting things to be noted in the matches between them and the most memorable photo of all time is the one you find below. None can forget this moment. Flintoff takes off his shirt in a one-day series after winning the match took place in Mumbai during 2002. By this win England vs. India series ended up with 3-3. That moment and Flintoff’s activity disturbed Indian captain Sourav Ganguly a lot. He reacted to that moment by kicking off a water bottle. Here comes the revenge during the Natwest Finals, at Lord’s off the same year. India won the Natwest series in finals against England and been a unbeaten team in ODI series of 2002. Here, "Dada"Ganguly took off his shirt and twisted and showed the revenge against that activity. It was really enjoyed by Indian fans. The matches are going to entertain every Cricket lovers around the world.